Many of you should really consider entering this. The Slate Book Review and the Center for Cartoon Studies are proud to announce the second annual Cartoonist Studio Prize! Each year the Cartoonist Studio Prize will be awarded to work that exemplifies excellence in cartooning. 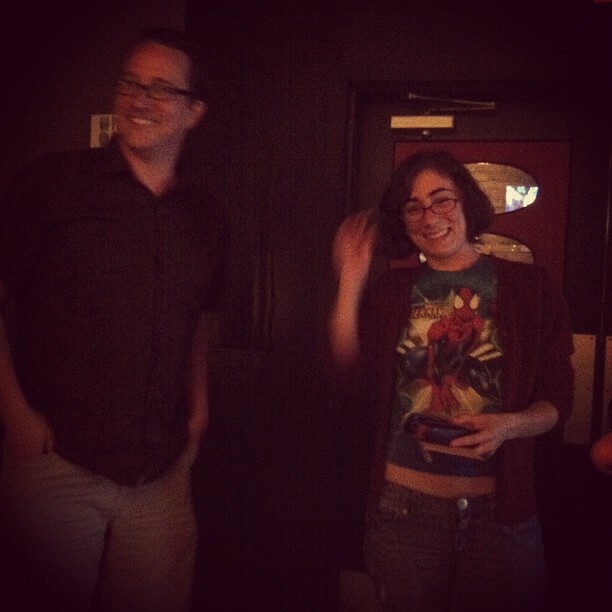 (Last year’s winners: Chris Ware and Noelle Stevenson.) The creators of two exceptional comics will be awarded $1,000 each. In addition, this year award sponsor Copic is providing each winner with $250 of art supplies. Winners will be selected by Slate Book Review editor Dan Kois, the faculty and students of the Center for Cartoon Studies, and a distinguished guest judge. This year’s guest judge will be Christopher Butcher of the world-famous comic book store the Beguiling and co-founder of the Toronto Comic Arts Festival. The two award categories for the Cartoonist Studio Prize are Graphic Novel of the Year and Web Comic of the Year. Finalists for each category will be announced Feb. 1, 2014. The two winning comics will be announced March 1, 2014. Eligible Graphic Novels must be written in (or translated into) English, published between Jan. 1 and Dec. 31 of 2013. To submit a comic for consideration, click here. Eligible Web Comics must be written in (or translated into) English, published online between Jan. 1 and Dec. 31 of 2013. Creators or publishers may submit a Web comic for consideration by clicking here. Submissions in both categories must be received by Dec. 31. Currently enrolled CCS students are not eligible for the award. No creator may submit more than one work in either category. The judging panel reserves the right to consider work that was not officially submitted. 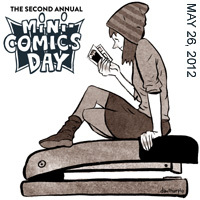 Mini-Comics Day Minneapolis 2012 (This Saturday, May 26th) Info… You Could Win the Stapler Award! Judges Announced. 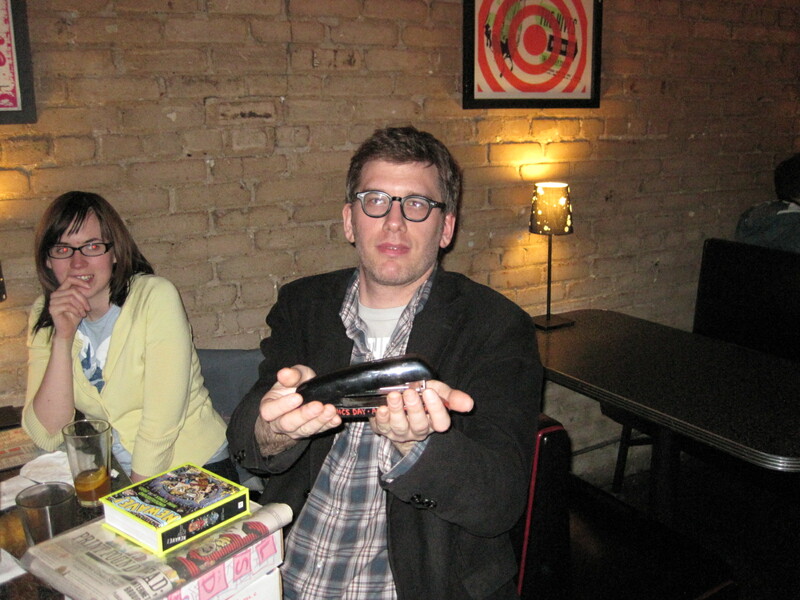 Pictured above: 2011 Stapler Award Winner Dan Murphy holds his prize. The self-descriptive “2012 Stapler Award for the Best Minnesota Mini-Comics Day Mini-Comic” will be given out around 8PM or so in the side room at Grumpy’s downtown after the event at Book Arts. You will need to submit three copies of your completed-that-day comic to enter. UPDATE: Besides the award, there will be cool prizes for the winner… a $25 gift certificate to Big Brain Comics courtesy of Big Brain Comics, and a free pass to the Northeast Ride ($25 value), courtesy of the Northeast CDC. Mini-Comics Day is this Saturday! 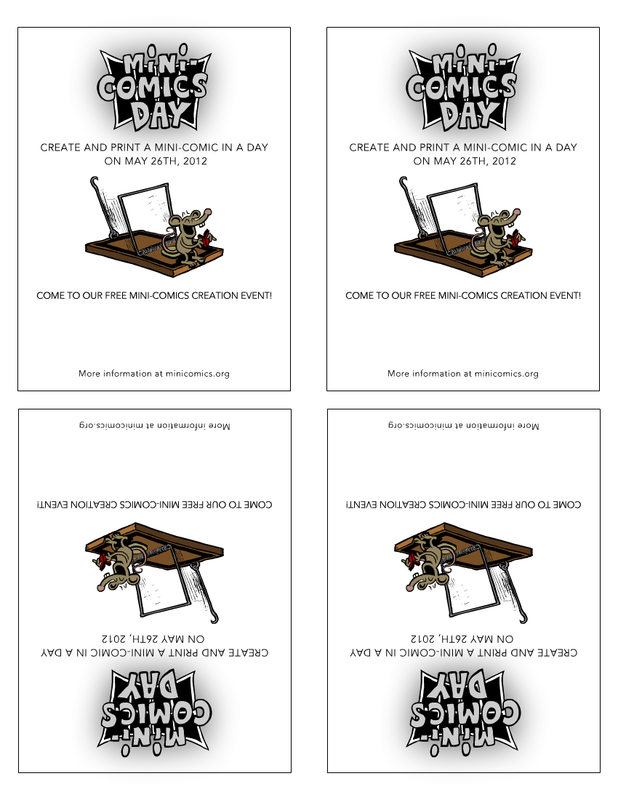 On Mini-Comics Day, participating cartoonists draw and print a mini-comic in a day. Any cartoonist in the world can participate in the event… if you would like to host an event in your community, contact us and we’ll get you set up. A copier will be available on site. Copies will cost $.02 each, but Big Brain Comics and Big Time Attic will generously be helping defray some of the expense. Afterwards, we will move a block over to Grumpy’s to give out “The Stapler Award for the Best Minnesota Mini-Comics Day Mini-Comic 2012.” To enter we will need three copies of your mini-comic before 7:30PM. 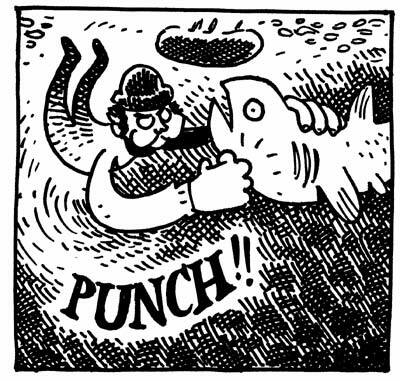 This may be a good opportunity for you to get a mini-comic ready for the upcoming Lutefisk Sushi Volume E project happening at Altered Esthetics in November. Help promote the event! Here are assets for the Minneapolis event by 2011 Stapler Award Winner Dan Murphy. Here is a poster you can print and hang. Here are flyers to leave around town. If you use facebook, you may want to sign up here. Submissions open for $500 comic art prize! Arts in Harmony, the largest international juried arts show in Minnesota, is once again calling for submissions, and once again there is a huge cash prize (courtesy of the Midwest Comic Book Association)! There is a separate comics art category, so no, your entry won’t be duking it out with oil paintings or marble sculptures. To be honest, there weren’t a ton of entries in last year’s show, which was too bad, but if the trend continues then your odds of winning are that much better — so submit something! Check out this list of last year’s winners, including our very own Brittch. Thanks to Britt Aamodt for the heads-up! 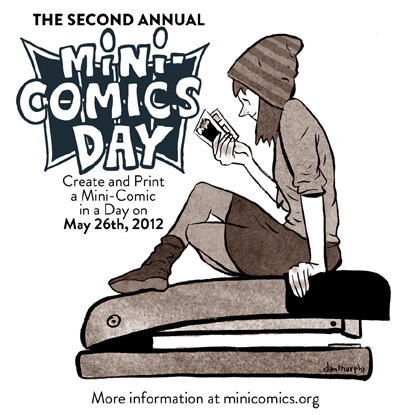 There’s a little over three weeks to Mini-Comics Day (April 9th)! 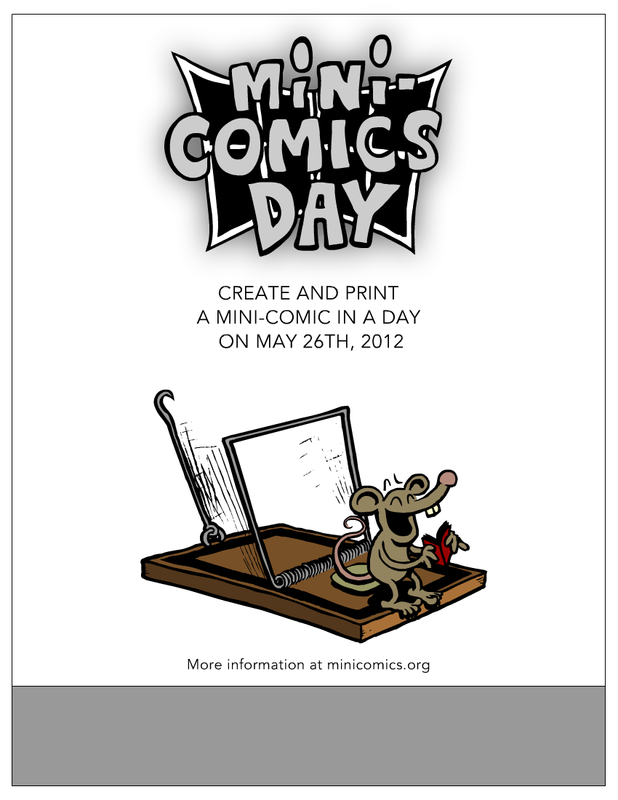 We currently have twelve sites listed around the world planning events for Mini-Comics Day. If you are interested in hosting an event, let me know… email me at webmaster(at)cartoonistconspiracy.com. There are some new resources available on the Mini-Comics Day website that event planners and participants may find useful, including customizable promotional posters and flyers. We also have templates available on that page that you can print or provide to people as an easy guide to lay out their mini-comics with (for 8-page and 16-page minis). Inexperienced mini-comics creators may want to print out the How to Make Mini-Comics mini-comic. 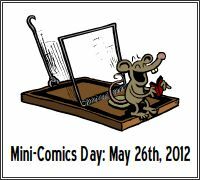 If you use facebook, you may want to check out the Mini-Comics Day facebook page. For the Minneapolis event we plan to have an after-party event where we will give out a prize for the local “Best Mini-Comic of the Day,” judged by three local non-cartoonists; author of Superheroes, Strip Artists & Talking Animals: Minnesota’s Contemporary Cartoonists Britt Aamodt, Big Brain Comics proprietor Michael Drivas, and Altered Esthetics founder Jamie Schumacher. The prize will include a copy of the book Newave! The Underground Mini Comix of the 1980s, courtesy of Big Brain Comics. We also hope to also include the comics submitted for judging in an upcoming gallery show at Altered Esthetics… more information about that soon. They are now taking nominations… deadline Monday, December 20th. More info here. When you vote for best new comic… did you realize that The Tatertotdiaperman Experiment by Lance Ward and Heck by Zander Cannon both started earlier this year? Arts in Harmony Comic Art award for $500… DEADLINE FRIDAY DECEMBER 3rd! Just a reminder… apparently there have still not been a lot of entries. Arts In Harmony, a national juried art show in Mn, will be presenting a $500 award for comic art this year. This is the first year they’ll be offering the award, sponsored by the Midwest Comic Book Association. Local Hero Kevin Cannon, Barb Schulz and I will be jurors for the comic art. Barb is also one of the overall jurors for the show. To enter, here is the prospectus/application form. Apparently there have not been a lot of comic art entries yet. Good luck! Thanks to Britt Aamodt for helping put together this wonderful opportunity for cartoonists, and thanks to the MCBA (and Nick Postligione) for so generously sponsoring it! You can see the nominees here and you can vote here. Voting is open to the general public. The Isotope Award for excellence in mini-comics is now accepting submissions (deadline October 1). The Best American Comics is now accepting submissions (deadline September 7). Minneapolis’ own local hero Kevin Cannon has been nominated for “best new talent” in this year’s Harvey Awards. Congratulations, Kevin! You can go vote here.